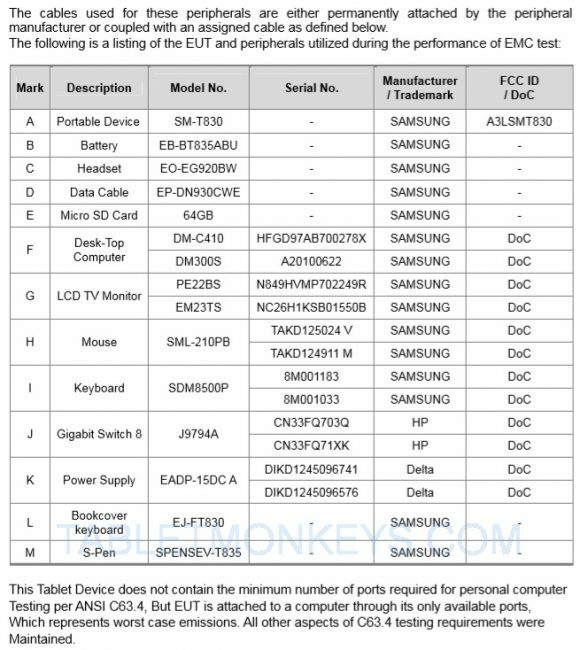 The upcoming Samsung Galaxy Tab S4 10.5 4G LTE (SM-T835) was listed as FCC approved last week, but this week we got the FCC approval for the Samsung Galaxy Tab S4 10.5 Wi-Fi (SM-T835) too. New specs or features identified are mainly the new Samsung S-Pen for the 10.5-inch Samsung Galaxy Tab S4. The new Tab S4 S-Pen has the model number SPENSEV-T835, so this stylus pen relates to the 4G LTE model as well. Samsung Galaxy Tab S4 (SM-T830) was also certified with the new Bookcover keyboard EJ-FT830. Samsung Galaxy Tab S4 is Samsung’s soon to be launched flagship tablet with Android 8.1, in a 10.5-inch tablet with 2560 x 1600 resolution, a Qualcomm Snapdragon 835 processor, 4GB RAM, 8MP and 13MP cameras, AKG audio, and a benchmarked multi-core score of over 6300 on Geekbench 4.